^ Miller, William D. (1982). Dorothy Day: A Biography. NY: Harper & Row. pp. 1–7. ^ Forest, Jim (2011). All is Grace: A Biography of Dorothy Day. Maryknoll, NY: Orbis Books. pp. 14–5. ^ Day, Dorothy (1981). The Long Loneliness: the autobiography of Dorothy Day. San Francisco: Harper & Row. pp. 43. ^ Forest, Jim (2011). All is Grace: A Biography of Dorothy Day. Maryknoll, NY: Orbis Books. p. 67ff..
^ Day, Dorothy (May 1978). “On Pilgrimage”. The Catholic Worker: 2. ^ A Russian neighbor's sister had named her daughter Tamar, and Day was impressed by St.Teresa of Avila, whose biography she had recently read. Miller, William D. (1982). Dorothy Day: A Biography. NY: Harper & Row. p. 184. ^ Atkins, Robert (May 1, 2013). 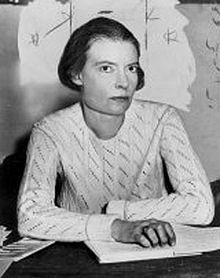 “Dorothy Day's social Catholicism: the formative French influences”. International journal for the Study of the Christian Church 13 (2): 96–110. doi:10.1080/1474225X.2013.780400. ISSN 1474-225X. https://doi.org/10.1080/1474225X.2013.780400. ^ Day, Dorothy (1938). From Union Square to Rome: Chapter 1. http://dorothyday.catholicworker.org/articles/201.html. ^ Day, Dorothy (1938). From Union Square to Rome: Introduction. http://dorothyday.catholicworker.org/articles/200.html. ^ “7 Pacifists Insist on Guilty Pleas”. New York Times. (2014年9月29日). http://query.nytimes.com/mem/archive/pdf?res=FB0F15FB3A5E107B93CBAB1782D85F418585F9 2014年1月26日閲覧。 The statute at issue was the New York State Defense Emergency Act. ^ Duty of Delight, 2011, p. 447. ^ Roberts, Nancy L. (1984). Dorothy Day and the Catholic Worker. State Univ of New York Press. p. 164. https://books.google.com/books?id=Wx5A4UE05QYC&pg=PA164&.